Addition to a carbonyl by a semi-anionic hydride, such as NaBH4, results in conversion of the carbonyl compound to an alcohol. The hydride from the BH4- anion acts as a nucleophile, adding H- to the carbonyl carbon. A proton source can then protonate the oxygen of the resulting alkoxide ion, forming an alcohol. Formally, that process is referred to as a reduction. Reduction generally means a reaction in which electrons are added to a compound; the compound that gains electrons is said to be reduced. Because hydride can be thought of as a proton plus two electrons, we can think of conversion of a ketone or an aldehyde to an alcohol as a two-electron reduction. An aldehyde plus two electrons and two protons becomes an alcohol. Aldehydes, ketones and alcohols are very common features in biological molecules. Converting between these compounds is a frequent event in many biological pathways. However, semi-anionic compounds like sodium borohydride don't exist in the cell. Instead, a number of biological hydride donors play a similar role. NADH is a common biological reducing agent. 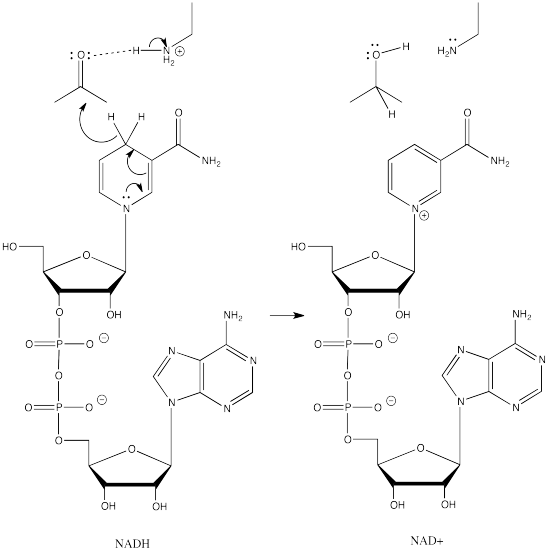 NADH is an acronym for nicotinamide adenine dinucleotide hydride. Insetad of an anionic donor that provides a hydride to a carbonyl, NADH is actually a neutral donor. It supplies a hydride to the carbonyl under very specific circumstances. In doing so, it forms a cation, NAD+. However, NAD+ is stabilized by the fact that its nicotinamide ring is aromatic; it was not aromatic in NADH.